The Koopa Master is an old Koopa Troopa who lives at the top of Pagoda Peak in Mario Party 7. 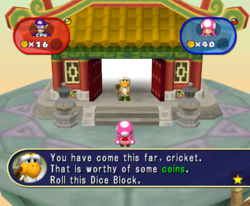 If the player gives him enough coins, Koopa Master will give the character who climbed the mountain a star; the player must pay either 10, 20, 30, or 40 coins, depending on what number the sign above his dojo currently shows. In the game's solo mode, he will give a star to the first player who reaches him with 100 coins. The Koopa Master has an apprentice named Kung Fu Koopa. The Koopa Master appears as an old, withered Koopa with a thin, wooden cane with a carved handle at the top. He has a green shell, dark-green shoes, and yellow skin with small, brown circles on his cheeks (presumably liver spots). He also has a white, long hanging beard and large, drooping, white eyebrows. This page was last edited on March 17, 2018, at 20:20.